With Thanksgiving eve right around the corner, those looking to expand their sprits palate before chowing down on some turkey need look no further than The Patio on Goldfinch in Mission Hills. Looking for a more intimate holiday celebration with family, friends or coworkers? Hornblower Cruises & Events provides several public holiday cruises that are perfect for couples, families or small groups. The holiday season has started and so has the challenging task of finding that perfect gift for everyone on your shopping list. It’s November and the holidays are right around the corner. 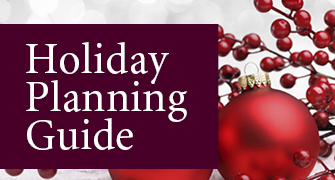 It’s still not too late to plan your best event ever! You need only look to San Diego Bay for your party planning inspiration. Host your holiday party on a luxury charter yacht for a fabulous and unique experience that is guaranteed to “wow” your guests. While it is almost November and many companies have had their holiday parties booked for months, it is still not too late to book yours. Team building is considered invaluable in developing employee interpersonal and social relationships, which is instrumental in improving company performance and achieving goals. However, few companies can schedule time for entire departments to be out of the office. Fortunately, it’s not too late to squeeze in a professionally organized day of bonding and team-building exercises before the year ends. Given that November and December seems to be when workloads level off and time is made for the year-end holiday party -- why not combine the two and take it on the water? At Hornblower Cruises & Events, we call this team building with a twist! The Lodge at Torrey Pines is synonymous with the holidays in San Diego and there’s no better place for a warm and inviting holiday party. The Bahia Resort Hotel provides a unique and magical venue for corporate holiday events for businesses throughout San Diego. The beloved resort is able to accommodate the smallest and largest companies, from groups of 10 in the La Jolla Room to 1,200 in the Mission Bay Ballroom. The Mission Bay Ballroom sits atop the Bahia’s tower, providing unmatched views of the twinkling lights on the bay and the city skyline. The Catamaran Resort Hotel and Spa offers a picturesque venue for corporate holiday parties. The Catamaran has been a cornerstone of Mission Bay for years, and it’s getting better with age. From cocktail receptions to dinner and dancing, the waterfront venue provides a gorgeous setting along with the perfect ambiance for celebrating the holiday season. Hosting a holiday party this year? Come December, most of the country is bundling in multilayers just to go outside. But here in San Diego, we are holding steady at a balmy 70 degrees. If you are responsible for planning the company holiday party this year, what is your first concern? Location. So why not take advantage of what makes San Diego so spectacular? The weather. Just add water -- and you have the ultimate venue for your party, a Hornblower Cruises & Events yacht. San Diego’s Harvest Festival returns for the 42nd year with affordable family fun, entertainment and shopping October 17 to 19 at the Del Mar Fairgrounds. The holiday season is time for family gatherings and office parties, but it can also be a liability to those who serve alcohol. That is why party hosts should protect themselves by making sure they have the proper insurance coverage and taking reasonable precautions to prevent any risks, warns the Insurance Information Institute. With so many food-filled festivities, it's easy to understand why many of us gain weight during the holiday season. At times, we may even find ourselves double-booked with more than one party to attend in one night. BizBash, which produces trade media for the event industry, and Seamless, a source for restaurant information and online ordering, published the results of its "Holiday Parties and Office Morale." The survey of more than 1,500 event planners and administrative professionals reveals the importance of holiday parties for office morale and the negative impacts of canceling a company holiday event on the perception of company health.